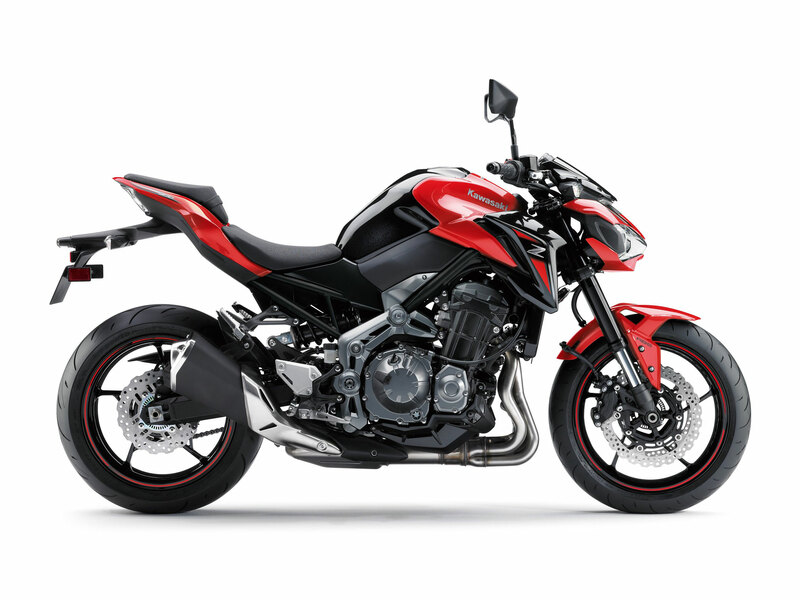 The 948cc engine has a smooth, linear power delivery that is easy to control and contributes to rider comfort and confidence, yet the strong mid-range hit that pulls hard to redline provides plenty of exhilaration. Responsive liquidcooled engine with efficient 4-valve, DOHC cylinder provides smooth performance at all rpm. • Lightweight crankshaft design augments the engine’s quick-revving character. 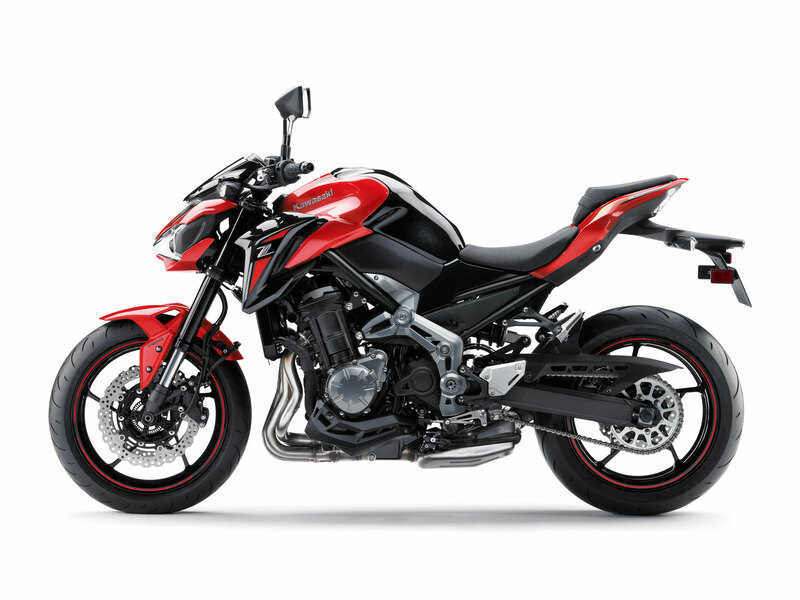 • A secondary engine balancer eliminates excess vibration, although a desirable amount is left in to add to the bike’s character and acceleration feeling. • Downdraft intake design provides the fuel mixture with the straightest, shortest path to the combustion chamber for increased performance. • 29mm intake and 24mm exhaust valves complement the port designs and boost the hard-hitting mid-range to highrpm power feeling. • Acoustic tests helped shape the air box for a stimulating sound that varies with engine speed to add to the riding experience, especially at high rpm. • The air inlet faces upward so that the intake note is easier for the rider to hear. • A dividing wall in the center of the upper portion of the airbox accentuates the high, clear intake note. • Intake funnels balance performance and sound. The longer 150mm inner pair strengthen the low-tomidrange performance while the shorter 50mm outer pair enhance the intake sound. • 35mm exhaust headers are tuned for top-end performance while lowering exhaust noise level at idle. Joint pipes between headers 1-4 and 2-3 help boost mid-range torque. • 5.5-liter pre-chamber allows a smaller muffler to be used and helps centralize mass, as well as lowering the noise level at idle. used for a lighter feel at the lever. During high back-torque, such as when too low of a gear is selected during downshifting, the Slipper function allows some clutch slippage to help prevent engine lock-up, stalling and rear wheel hop. • Short gear ratios for first through fifth gears provide strong acceleration in the mid-range, the mostused part of the powerband for everyday riding. • Sixth gear is an overdrive gear for more relaxed highway cruising. 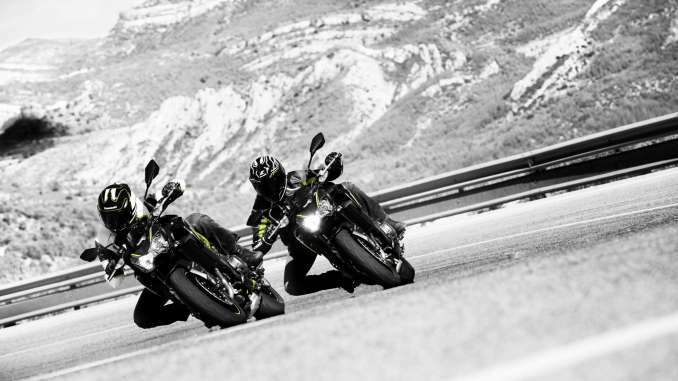 • A key component to the Z900’s light weight, the frame weighs in at just under 30 pounds and contributes significantly to the bike’s light, nimble handling. • 41mm inverted front fork features stepless rebound damping and spring preload adjustability in the left fork tube, with the adjusters conveniently located on the fork cap. •The linkage is placed atop the swingarm for better mass centralization and to make room for the exhaust pre-chamber. •Lay-down shock absorber is further away from the exhaust so that its operation will not be affected by exhaust heat. The shock has adjustable preload and rebound damping. •Extruded aluminum swingarm is lightweight and rigid. •Suspension settings provide both sporty performance and comfort. • Dual 300mm front petal discs and 250mm rear petal disc are clamped by dual opposed piston calipers with resin brake pads to deliver ample braking power. • A linear brake touch facilitates control for riders of all skill levels. • ABS model helps prevent wheel lock-up during sudden over-application of the brakes or while braking on low-grip surfaces for an added degree of reassuring braking performance. • Five-spoke star-pattern wheels are light weight with high rigidity to benefit handling. • Silica-blend Dunlop D214 Sportmax tires provide both enhanced wet-weather performance and increased tire life. •A wide, flat handlebar and relaxed yet sporty riding position offers a blend of control and comfort that allows the rider to enjoy a variety of riding situations. 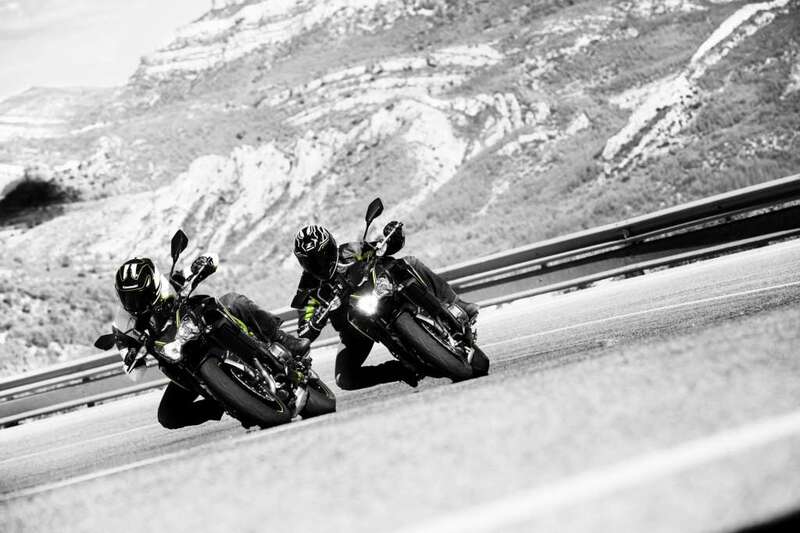 • The handlebar/seat/footpeg relationship helps enhance communication between the rider and machine, giving the rider confidence-inspiring feedback. 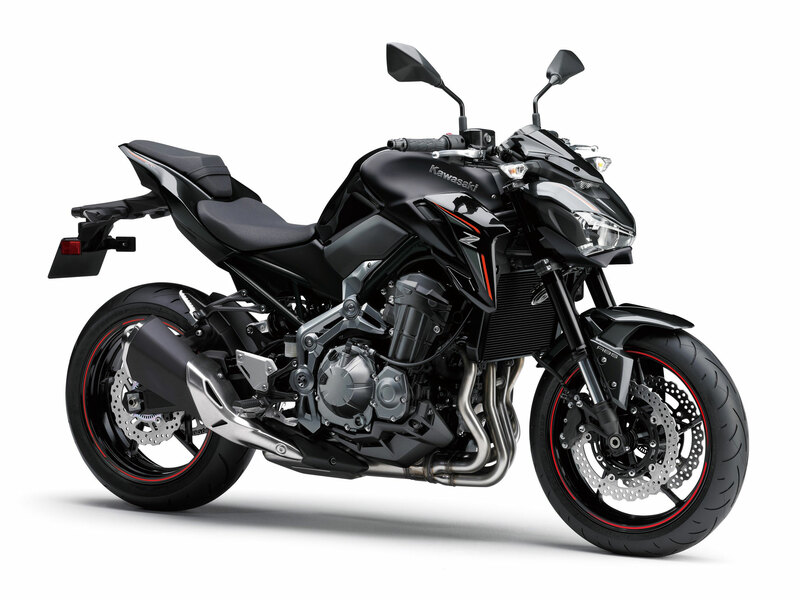 • The fuel tank is narrow at the rear to help riders grip the bike with their knees. • A low seat height and slim overall design facilitates riders placing both feet on the ground for smoother, confident stops. • The rider’s seat is slim at the front to facilitate the reach to the ground and wider towards the rear for good ride comfort. • Rubber-mounted handlebar ends and footpeg pads, as well as rider footpeg weights, help dampen vibrations for a more comfortable ride. minimalist coverage in the engine area is devised to draw attention to its functional beauty. A condensed appearance emphasised by slim, close-fitting bodywork gives the bike a light, agile image that reflects its sporty performance. • Headlight cowl and meter visor help form a slim, flowing line from the top of the elegantly sculpted fuel tank for an aggressive appearance. • Resin fuel tank cap has no visible bolts for a cleaner look. •Engine shrouds have a sharp shape with minimal overhang add to the flowing design, allow a clear view of the engine, and contribute to a condensed, lightweight look. •Under cowls have a unitized design so that they look like part of the engine. •Flowing, upswept tail cowl contributes to the sporty image.